T-Mobile has been closing the gap on Verizon’s lead in our surveys over the past three years. The latest results show T-Mobile has now moved into the top spot in overall customer satisfaction, loyalty, and preferences among planned switchers. Verizon still leads in satisfaction with coverage, reliability, speed of network and streaming video quality. But T-Mobile continues to challenge the status quo by pressuring the competition with non-traditional offerings while remaining sensitive to price. The survey of 4,125 primarily North American respondents from 451 Research’s Leading Indicator panel looks at key wireless industry trends – including data plans and usage, as well as the impact of T-Mobile’s One unlimited data plan. 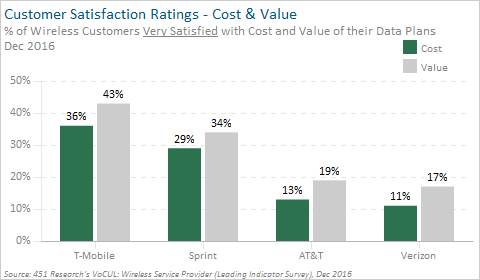 T-Mobile (38% Very Satisfied) now leads the wireless industry in customer satisfaction, up 3 points since the previous survey in September 2016. Verizon (37%; unchanged) is a close second, but remains at its all-time low in satisfaction. Sprint (28%; up 2 points) has moved into a tie with AT&T (28%; up 1 point) for third place. We note this is the first time Sprint has ranked third in over three years. Customer Loyalty: Wireless subscriber churn remains in check despite aggressive promotions around devices and data plans among the four major carriers. In the latest survey, less than one-in-ten (9%) respondents plan to change wireless carriers in the next 90 days – down 1 point since September, but unchanged from a year ago. T-Mobile (8%) has a slim edge over the competition, registering the industry’s lowest churn rate. Verizon (9%) and AT&T (9%) customers are nearly as loyal. Customer retention is more of a concern for Sprint (13%). Though the current results are an improvement since the previous survey, it is 4 points worse compared to a year ago. Why Subscribers Switch or Stay: Cost remains the key reason for switching among Sprint (36%), AT&T (41%), and Verizon (57%) customers. On the other hand, just 16% of T-Mobile subscribers plan on switching because of cost. What’s the most important reason why you’re likely to change wireless service providers? Mobile network performance remains the biggest reason why T-Mobile customers want to switch (31% Poor Reception/Coverage), but their low overall churn rate suggests that T-Mobile customers consider the trade-off with lower price worthwhile. The trade-off is the opposite for Verizon customers. Verizon’s relatively low churn is an indication that their subscribers are willing to pay a higher price for network performance, with just 6% citing Poor Reception/Coverage. According to Rich Karpinski, 451 Research Principal Analyst – Mobile Operator Strategies, “T-Mobile passing Verizon in the all-important Very Satisfied metric is a significant milestone. Ultimately, it reveals two things: happy customers at T-Mobile and questioning customers at Verizon. As we saw in Verizon’s latest earnings results, our VoCUL Leading Indicator survey results track closely to reality. 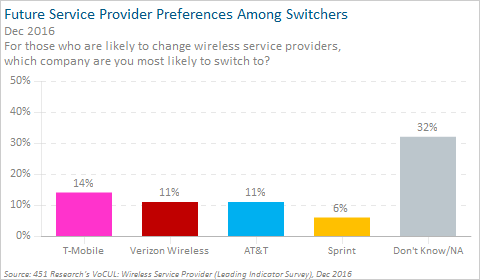 Future Service Provider Preferences: T-Mobile (14%) is the most preferred wireless service provider among planned switchers in the latest survey. Verizon (11%) and AT&T (11%) rank second. For AT&T, this is the best result in the past two years, while for Verizon this is the provider’s worst mark over the same time frame. Sprint has been unable to move the needle in its favor, as just 6% of switchers say they would most prefer to sign up with Sprint. Unlimited data plans have roared back into the wireless conversation, a trend that has largely resulted from the rollout of new T-Mobile and Sprint wireless plans, along with AT&T’s DirecTV bundled unlimited offering. The lack of a jump for unlimited data plans is somewhat surprising, despite recent marketing efforts promoting unlimited offerings. “Unlimited plans will make their mark, but it may take some time. Device financing and upgrade plans – as well as a variety of limited time promos and grandfathered offers – mean that T-Mobile and Sprint customers won’t all jump to unlimited at once. Plus T-Mobile only moved to exclusively offering its T-Mobile One unlimited plan in January,” notes Karpinski. This latest survey shows 15% of T-Mobile subscribers have signed up for the One unlimited plan, and another 20% are considering signing up in the next 90 days. Importantly, more than a quarter of T-Mobile One subscribers (27%) say they switched from a different wireless provider to sign up. Note that the survey was conducted before T-Mobile announced its updated One plan which now includes taxes and fees as part of its advertised price. Previous Wireless reports highlighted how T-Mobile’s BingeOn offering acted as catalyst for higher customer satisfaction. Being able to stream unlimited video without using monthly data allowance was a strong incentive, as customer satisfaction among BingeOn users was higher than all other T-Mobile subscribers. Is the T-Mobile One plan having a similar impact? Yes, T-Mobile One customers rated their service higher than all T-Mobile customers nearly across the board – with the biggest margin being in Value (50% T-Mobile One vs. 43% all T-Mobile customers). Data Plan Satisfaction: Turning to customer satisfaction with specific aspects of their data plans, we see the narrowest disparity among the major providers for Quality of Streaming Video. Verizon (36% Very Satisfied) has an edge over the competition, but T-Mobile (34%) and Sprint (34%) customer satisfaction is only 2 points lower, even though both cap most streaming video at standard definition quality (i.e., 480p). How satisfied are you with each of the following aspects of your current data plan? AT&T customers (31%) are relatively less satisfied with their video quality, but it’s not far behind the other three providers. This may however change as AT&T will now limit video traffic to 480p quality across most plans through its ‘Stream Saver’ feature. In terms of other aspects, Verizon wins big in Coverage (54% Very Satisfied) and Reliability (51%), but when it comes to Speed of Network, Verizon (38%) holds a small lead over the next closest competitor T-Mobile (35%). The satisfaction ratings for Cost and Value clearly show that despite limits on video streaming and network performance, T-Mobile and Sprint customers feel they’re getting a greater bang for their buck. Cost and perceptions of value remain a challenge for AT&T and Verizon. Data Plan Changes – Next 90 Days: Just one-in-ten (11%) respondents say they’ll change their type of data plan over the next 90 days. Tiered (14%) and shared (12%) plan customers remain more likely to say they’ll make a change than unlimited users (7%). At the provider level, Verizon customers (13%) are most likely to change their type of plan, while Sprint and T-Mobile customers are least likely (7%). 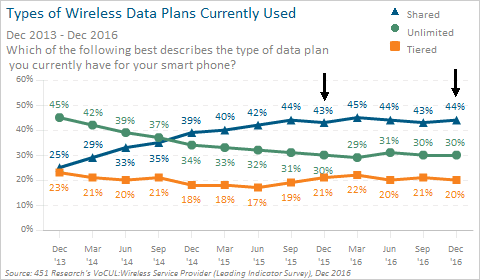 Importantly, more than half of respondents changing their data plan (55%) also plan on switching wireless service providers. And among customers sticking with their current wireless carrier, 88% say they’re unlikely to change their data plan. How likely are you to change the type of data plan you have over the next 90 days? Among all respondents changing data plans, two-in-five (42%) want an unlimited plan. This is largely driven by those who are also switching wireless providers, as nearly half (47%) of this group say they want an unlimited data option. Subscribers staying with their current carrier are equally likely to choose either an unlimited (33%) or shared (34%) option when they change their data plan. Which type of data plan will you most likely switch to? 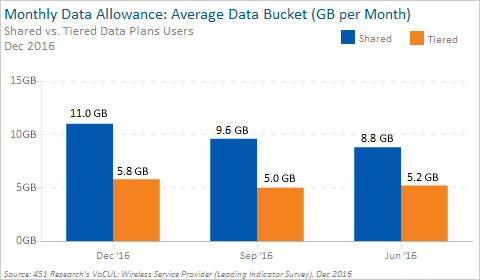 Among shared plan users, the average data bucket now consists of 11 GB per month – an increase of more than 2 GB since June 2016. Some of this increase can be attributed to AT&T and Verizon now offering higher amounts of data across their shared plans. The average data allowance for a tiered plan is nearly 6 GB per month, which has stayed relatively stable since June 2016. How do shared and tiered plan users manage their data use to prevent overages? It’s a combination of using Wi-Fi hotspots (43%), avoiding streaming music or video apps (41%) and limiting use of their phone while not connected to Wi-Fi (36%). Concerns about Data Overages: The survey asked how concerned respondents were about exceeding their monthly data plan allowance, and found Verizon subscribers (35%) most concerned – despite the availability of ‘Safety Mode’ on the new Verizon Plan, which allows users to browse at 2G speeds after running out of data. Just 10% of Verizon customers say they’ve enabled Safety Mode on their plan, but this may be due to customers being required to opt into this feature. “Price certainty, above any other concern, drives customer wireless decisions. Our survey data backs that up. Customers don’t want to pay more than expected for their wireless service. Verizon’s Safety Mode approach offers price certainty – as does the throttling approach that many carriers offered the past few years,” says Karpinski. Putting this in context, AT&T also offers overage protection on its new plans, but it’s automatically enabled. Sprint and T-Mobile no longer charge overages by default for all plans. This could explain why AT&T (27%), Sprint (22%) and T-Mobile (16%) subscribers are less concerned compared to Verizon. T-Mobile is the new industry leader in customer satisfaction, loyalty and preferences among switchers. This is not surprising, with our surveys over the past three years showing consistent momentum for T-Mobile as it rolled out its Uncarrier strategy of disruptive services while being sensitive to price. Verizon’s advantage remains the strength of its network – coverage, reliability, streaming video quality, and speed of network – all categories in which Verizon still rates the best. While Verizon has added more GB to its plans in the second half of 2016, it still does not offer an unlimited data plan option. In its place Verizon now offers Safety Mode to avoid overages, and PopData, which allows subscribers to buy 30-60 minute increments of unlimited data use. Karpinski concludes, “Trendlines being trendlines, it wasn’t difficult to foresee this day coming. T-Mobile’s Uncarrier strategy has been winning subscribers, at the rate of 8 million net-adds per year for the past three years. It is simply gaining more customers, and keeping them happier with its creative and aggressive approach.